Web of Science: Does the puffin only live on Grímsey and in the Westmann Islands? Does the puffin only live on Grímsey and in the Westmann Islands? The answer to this question is no. Puffin colonies can be found almost all round the country, although the largest colony is in the Westmann Islands. 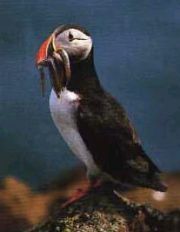 There are hundreds of puffin colonies around the country, but only a few will be mentioned here. There are some puffin colonies in the Reykjavík area, some very large, like e.g. in Kollafjörður. One could also name Lundey with about 10,000 pairs and Akurey with 12,000 pairs. The colony at Andríðsey, off Kjalarnes, is considerably larger than the one in Kollafjörður and is the largest colony within the boundaries of Reykjavík. Young puffins sometimes stray into the city in late summer, doubtless birds from some of the city colonies. There are many large colonies in Breiðafjörður, where the local people have used them as a source of food for centuries. In East Iceland there are large colonies at a number of locations, e.g. the colony at Hafnarhólmur in Borgarfjörður eystri. The best known puffin colony in East Iceland is probably at Skrúður Island, off the mouth of the Fáskrúðsfjörður fjord. Ornithologists have estimated the colony at 150,000 pairs. There are also large colonies in the West Fjords, both at the great bird cliffs and at Vigur Island in Ísafjarðardjúp. In the South one could mention the colony at Ingólfshöfði and at Reynisfjall cliffs at Vík í Mýrdal. The largest nesting colony is in the Westmann Islands, where the puffin is more of a symbol for the islands than any other bird. The number of nesting birds in the island colony is estimated at several million while there is a total well over 10 million nesting birds for the country as a whole. The puffin is numerically the largest nesting species in Iceland. Jón Már Halldórsson. „Does the puffin only live on Grímsey and in the Westmann Islands?“. The Icelandic Web of Science 7.3.2005. http://why.is/svar.php?id=4817. (Skoðað 21.4.2019).